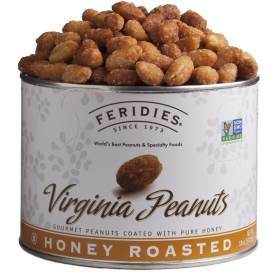 FERIDIES® Honey Roasted Virginia Peanuts are covered in a light honey coating, creating the perfect combination of sweet and salty. Looking to taste the pure delicious goodness of Virginia peanuts with a hint of natural sweetness? Sample our honey roasted peanuts today to find out what keeps our customers coming back for more. We start each batch of roasted nuts with only the largest, freshest, and cleanest peanuts straight from the Virginia fields. Since these peanuts are already known for offering the best crunch and highest nutritional value, we roast them carefully to preserve their best features while adding a more intense flavor. As part of the roasting process, we apply a generous coating of our secret honey roasting coating. The coating is light but flavorful, packing each nut with all the sweet and salty flavors you've come to expect. A handful of honey roasted peanuts is a quick and healthy snack for refueling on the go because the legumes provide both healthy fats and plenty of protein while the sweet coating offers instant energy. The crisp shell gives the nuts just a little extra crunch, making each bite a satisfying way to snack or enjoy a light dessert. Order more peanuts than you think you need to experiment with using these honey roasted peanuts in other dishes. From topping a strawberry and spinach salad to adding crunch to your next batch of peanut butter cookies, there's no end to the potential uses for these nuts. Practically any dessert, ice cream sundae, or peanut chicken dish can benefit from the quality of Virginia peanuts. Prefer plain varieties for using in savory and sweet dishes alike? We also carry plenty of salted, roasted, and raw Virginia peanuts in our other categories to meet your needs. All of our candied nut products are packaged carefully to keep them fresh and crisp for as long as possible. Honey roasted peanuts are packed into durable foil bags with zipper closures or tins with tight fitting lids, depending on the amount you order at one time. You can also transfer the nuts into other airtight storage containers after receiving them, but don't leave them out in open bowls or even covered dishes for too long. Our peanuts are Kosher certified and are Non-GMO Project certified. 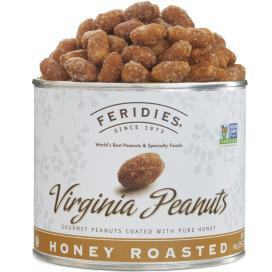 Order now to taste the difference that comes from using real Virginia peanuts.